Kitchen Basics Spiral Vegetable Slicer Only $9.95 + FREE Shipping! You are here: Home / Great Deals / Amazon Deals / Kitchen Basics Spiral Vegetable Slicer Only $9.95 + FREE Shipping! Want to make some fun spiral slices with your veggies? 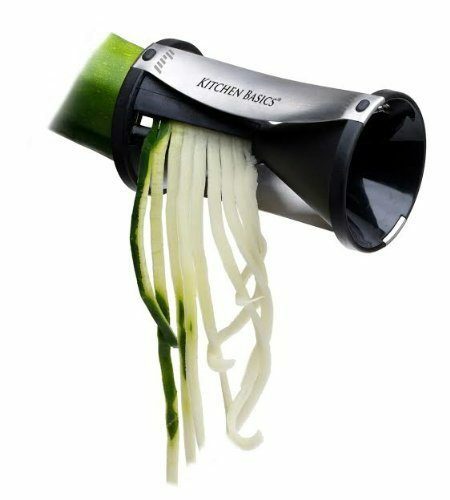 Do it easily with this Kitchen Basics Spiral Vegetable Slicer , priced at just $9.95 from $29.95! And, shipping is FREE with Amazon Prime or Super Saver Shipping! This is a great way to get your kids to eat their veggies (who could say no to fun spiral veggies??) and to use as an alternative to spaghetti noodles! Create endless Julienne strips; Spiralize zucchini, carrots etc. Requires no assembly; fully assembled and ready to use at a moment’s notice.